The Statue of Our Lady of Fatima in front of the basilica. 2017 marks the centenary of the apparitions of Our Lady to the children in Fatima. 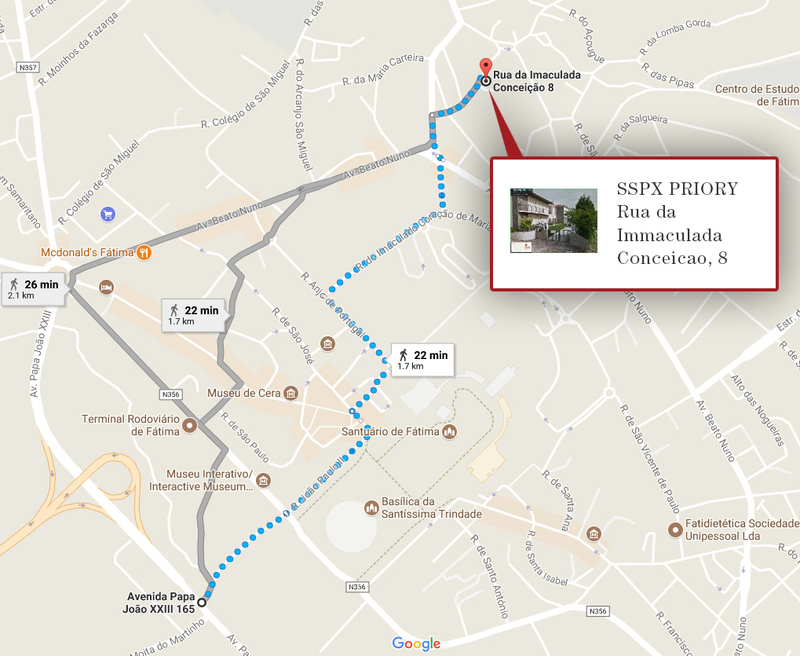 In honor of this milestone, the Society of St. Pius X is organizing an international pilgrimage to Portugal. The faithful who can are heartily encouraged to come and celebrate this anniversary while imploring Our Lady to win the necessary graces for the Church and the world. 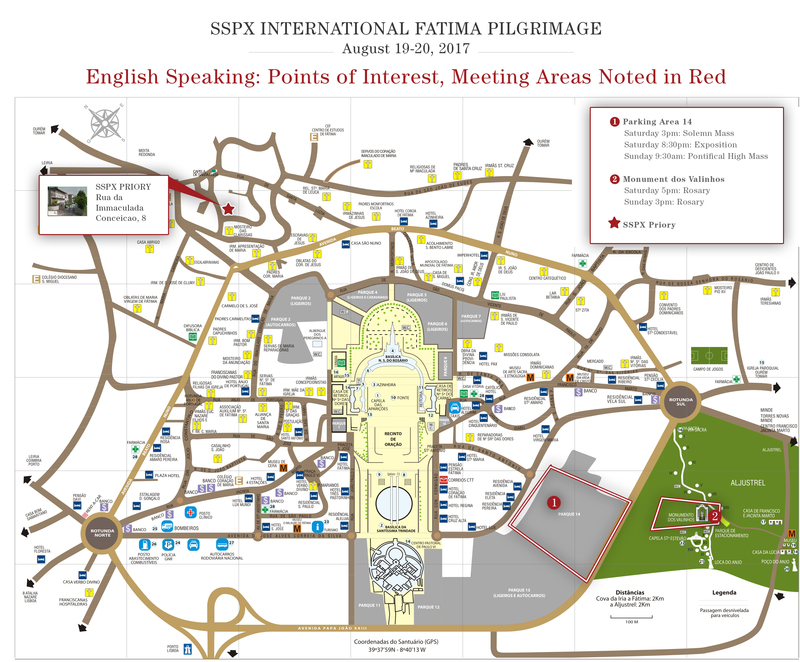 The Society's pilgrimage covers two days: August 19th and 20th. Solemn Mass (Our Lady of The Rosary, October 7) celebrated by Fr. Franz Schidberger, rector of the SSPX seminary Herz Jesu, Zaitzkofen, Germany - Shrine: "Parking 14". After Mass, follow the procession to get to the location where the rosary is prayed. Holy Rosary - "Os Valinhos". All night Adoration of the Blessed Sacrament - "Location: Parking 14". Benediction of the Blessed Sacrament - " Parking 14". Pontifical Mass (Immaculate Heart of Mary, August 22) offered by the Superior General, Bishop Fellay - "Parking 14". Holy Rosary and conclusion of the Pilgrimage - "Os Valinhos." After the closure of the pilgrimage Bp. Fellay will preside the commemorative ceremony of the 100 anniversary of the foundation of the Militia Immaculatae. May 13 is the anniversary of the apparition of Our Lady to three shepherd children in the small village of Fatima in Portugal in 1917. She appeared six times to Lucia, 9, and her cousins Francisco, 8, and his sister Jacinta, 6, between May 13, 1917 and October 13, 1917. The story of Fatima begins in 1916, when, against the backdrop of the First World War which had introduced Europe to the most horrific and powerful forms of warfare yet seen, and a year before the Communist revolution would plunge Russia and later Eastern Europe into six decades of oppression under militant atheistic governments, a resplendent figure appeared to the three children who were in the field tending the family sheep. “I am the Angel of Peace,” said the figure, who appeared to them two more times that year exhorting them to accept the sufferings that the Lord allowed them to undergo as an act of reparation for the sins which offend Him, and to pray constantly for the conversion of sinners. She also revealed that the children would suffer, especially from the unbelief of their friends and families, and that the two younger children, Francisco and Jacinta would be taken to Heaven very soon but Lucia would live longer in order to spread her message and devotion to the Immaculate Heart. That same day, 70,000 people had turned out to witness the apparition, following a promise by the woman that she would show the people that the apparitions were true. They saw the sun make three circles and move around the sky in an incredible zigzag movement in a manner which left no doubt in their minds about the veracity of the apparitions. By 1930 the Bishop had approved of the apparitions and they have been approved by the Church as authentic.